As all attention is focused on Syria . . . where oil is concerned the focus should be on Iraq, which is about to implode from sectarian violence, and Libya, which is now producing at about one-tenth its capacity, challenged by a variety of militant forces created by the last big intervention two years ago. Inside Intelligence - Engaging Iran in Syria. The Syrian army has resumed its offensive with renewed vigor after the US backed down from a decision to strike Syria and accept a Russian diplomatic solution in the form of chemical weapons inspections, but there is more to this than meets the eye: There are indirect talks with Iran, and what appears to have been a failed rebel offensive launched from Jordan. Analysis: Washington is bringing Tehran into the diplomatic Syrian cocktail, envisioning the use of Iran to actually promote a regime chance peacefully in Syria, once it is clear that Assad no longer has legitimacy, which would ostensibly be done via the chemical weapons inspections. In the midst of this, we learn that there was a defining incident right before the US backed down on a Syria strike: Reports are emerging that the US and other “foreign forces” sponsored a major rebel offensive launched from Jordan and intended to reach Damascus, which failed miserably, right before the US made its decision over whether to launch a strike on Syria. The rebels appear to have suffered considerable losses in this failed operation. Recommendation: US-Iranian direct diplomatic engagement is gaining significant traction, so too is engagement between Western Europe and Iran. (Indeed, Iran already claims to be holding talks with an unnamed European country for gas supplies.) Over the weekend, an influential Iranian official (head of the parliamentary national security and foreign policy commission) actually suggested that the next round of Iranian nuclear talks be held in Tehran. The significance of this is it allows for the first visit by top US diplomats to Tehran since 1980—and it provides an easy way for “direct” talks between Washington and Tehran without making it look like Obama is weak on Iran. A day after this suggestion was made Tehran said that President Rouhani had agreed to meet British Foreign Secretary William Hague on the sidelines of the UN General Assembly meeting in New York later this month, should Hague accept the offer. The disastrous rebel offensive launched from Jordan, aside, this is no longer Washington fumbling—bringing Iran into the diplomatic fray could be a brilliant play that forces Iran and Russia to face off (because they are not always the best of allies) and is the best chance of a solution for the conflict in Syria. Because at the end of the day, a US strike on Syria would not have decimated Assad, and even if it had, it wouldn't have been devastating for Iran. Executive report - Libya: The Fate of Oil under an Impotent Government. This report we examine the current situation in Libya, and how this is affecting production and global oil prices. Crisis in Full Force. The oil industry has all but been halted, and black outs are becoming more frequent as utilities don’t have the fuel to provide. This will further feed the fire of strikes, protests and the multi-pronged battle for control of the country’s resources. The crisis began two years ago with the overthrow of Muammar Qaddafi, but in August things took a definitive turn for the worse, with armed groups seizing major oil export terminals and demanding autonomy for the eastern region. Now the crisis has reached the west where other militant formations ominously charged with guarding the country’s pipelines and oil fields are seeking to profit on the momentum of the strikers and protesters in the east. The interim government cannot manage this crisis. It’s already been forced to compromise, agreeing just last week to a 20% wage hike across the board for civil servants, and including oil security forces in this mix. At the same time, the government has issued warrants for the arrest of strike organizers in the east. While the government will not be able to enforce these warrants, the blowback for this will be severe and will result in a violent upheaval unlike anything else in the past two years. This will reverberate throughout the already volatile Sahel region, threatening security in Tunisia and Algeria most immediately. It is also leading to a tightening of world oil supplies. Government Impotence. The interim Libyan government is impotent at best. The most depictive assessment would be that there is no functioning central government at all—a variety of militias control everything, having carved out mini-fiefdoms across the country. The very same militias it has relied on for security over the past two years are now aligning themselves with strikers and protesters. Issuing arrest warrants is futile at best, and they could only be enforced by using those same militias to arrest their new allies. This is not going to happen and the government has demonstrated only one thing: It has no strategy other than an incoherent plan that wavers between compromising and lashing out, making zero headway in the end. 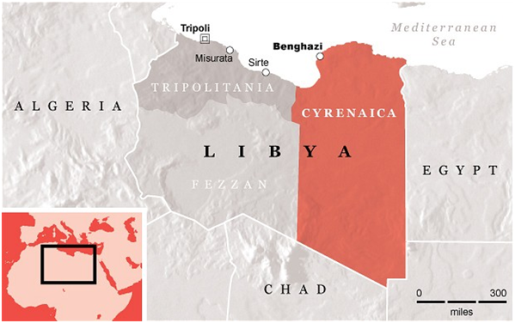 In the country’s east, we have bands of Islamist militias involved in drug-trafficking and controlling routes from southern Libya to the coast—ultimately funding splinter groups connected to al-Qaeda in the Islamic Maghreb (AQIM), which poses a terrorist threat across the Sahel region. It is here that the greatest resistance to Gaddafi was found—and here that the West found its best allies in the Libyan conflict, and now its best enemies. It is these militias that are supporting the strikers who have largely managed to halt production and exports in the region. The Barqa Youth Movement has now declared the eastern area an autonomous federal province within the framework of the Libyan state. They've declared a temporary president for the province, stating that Islamic Sharia “is the source of legislation in the province,” and are putting the final touches on their own “defense forces”. In the west, we have the heavily armed Zintan militia, which is working to overpower the country’s weak security forces—and gaining ground. Up against these forces, it is no mystery why the last interior minister lasted only two months in office, resigning on 18 August. Libya’s Oil Outlook. Under Qaddafi, Libya was producing about 1.5 million barrels of crude daily. This summer it was producing a meager 550,000 barrels per day, and now it’s producing ONLY 150,000 barrels per day and exporting only 80,000. Libya’s economy relies on oil for 95% of its export earnings, and right now it’s losing around $130 million day in revenues due to its inability to assert control over the situation. Oil also provides about 75% of the government’s budget and in about six months this will run about and not only will we be talking about blackouts from utilities who don’t have enough supplies to operate fully, but a complete breakdown in state institutions and public services. There won’t be any new investors on the scene right now—not until they are convinced that the interim government can handle the situation. Fields can’t produce in this chaos, and foreign oil workers aren't hanging around to operate in an environment that is beyond insecure. In terms of global output, Libya accounts for about 2% of supplies. Right now, the only thing keeping oil prices from rising on fears of Libyan impotence is an increase in production from Saudi Arabia and other OPEC members, as well as the obsessive new production from US shale plays. Even the capital Tripoli is out of control, and the new modus operandi for militants is the vehicle-borne improvised explosive device (VBIED), and can be waiting for government heads and security forces outside any official building or venue at any time. The targets are general government and security forces rather than specifically foreign oil workers, but foreign diplomats are not immune, nor are high-profile hotels that would house them or their guests. Most recently, on 11 September, security forces successful thwarted an attack on the Foreign Ministry building in Tripoli, but on the same day in Benghazi, a VBIED was detonated outside the foreign ministry building there, and right next to the Central Bank of Libya. This was the one-year anniversary of the attack on the US consulate in Benghazi in which US Ambassador Christopher Stevens was killed. On 10 September, a retired army colonel was assassinated in a bomb attack in the Hay al-Salaam district. The bomb was planted on the underside of the colonel’s vehicle and detonated by remote. The inability to gain any control over the security situation is leading to an opening for political rivals, with the Muslim Brotherhood’s Justice and Construction Party (JCP) stepping up calls for the resignation of Prime Minister Ali Zeidan. Zeidan is not likely to last long given his inability to handle the situation, so we are moving quickly here towards a violent political crisis that will unleash the full force of the country’s countless militias. The 3 July coup in Egypt has also played a role in the Muslim Brotherhood’s new momentum towards regime change in Libya. Zeidan’s recent visit to Egypt is being perceived by the Muslim Brotherhood as signal that the Libyan prime minister believes the military coup was justified. The Muslim Brotherhood is considering withdrawing from the government in protest, and this would be a significant play since its party members currently control key ministries, including the oil ministry and the economy, housing, electricity and youth ministries. Source: Inside Intelligence with ISA Intel and Executive Report with Southern Pulse, OilPrice.com Premium Newsletter. The above information is provided by an OilPrice.com subscription service to the Editor of ARRA News Service. Tags: Examining, Syria, Iran, Libya, threats, government stability, oil production, insider intelligence, executive report, OilPrice.com To share or post to your site, click on "Post Link". Please mention / link to the ARRA News Service. Thanks!